It’s not the cold what kills you. Not the naarg-wolves neither, Maw says, though they’re plenty scary. No, it’s the Dreams what’ll get you in the end. Dreams what wake in winter and sleep in summer. If only summer weren’t so short. Like the song of a chitkil it is, a burst of glory that leaves you colder, darker than before. But the cold and dark has a song all its own. I got no fancy words for it, but when the moon of long shadows rises over the top of the black ice forest, I get all chokey, like something’s trying to force its way out of my throat. Maw says horrible things but she don’t mean nothing by it. She’s been a bit off since Paw disappeared. Into the snowfield he vanished, with nary a footprint for anyone to see. Maw set the dogs to follow him and they didn’t come back neither. Me and Jacob were in town, selling skins. By the time we made it back home, the first storm of the season was howling in our faces, and it were all we could do to throw ourselves inside and bolt the door. That were a couple of moons ago. Now it’s just Maw and me and my brother Jacob and my sister Hilsa in the wood and stone house Paw built so many years ago. The beams are rotting—every night I breathe the musty smell and think of how Maw were always after Paw to replace them. Word got around that we’d lost Paw and the dogs, and the mayor came by in his skid. “We can grow you more dogs but it’ll cost,” he said, and then he looked at me and licked his lips like I were a hank of roast gizla. Maw raised her dart gun and said, “Git your dirty boots off my land,” and that were that. No one’s come by since. Can’t say I’m sorry ’bout that. They didn’t say nothing, but I knew what they was thinking: fool Maw and Paw to pretend they’d won a lottery when all they’d won were a one-way ticket to exile. No one comes to Charaid now, and the nearest colony with more’n a few dozen families is eleven parsecs away. Jacob’s nineteen Earth years, and he says he still remembers what it was like back on the old mother planet. Hilsa doesn’t—she was born on the ship—but he keeps telling her stories, showing her these vids of a warm, wonderful place with lots for everyone to eat, and no winter at all. He tried showing me his vids, but Paw had told me the real story—how the seas had risen and swallowed whole cities, how you couldn’t breathe without a mask. Only a lucky few thousand won the lottery to escape Earth every year. Jacob pulled my hair and I kicked his shins and then Maw came flying out of the kitchen and landed us a few with her boots. We slunk out into the cold and jumped up and down trying to warm ourselves. That’s malarkey and I kicked him again, but he just stared at me like I was some stranger what had come knocking at the door and set the dogs a-barking. I wish there was others like me—kids born on Charaid. But I’m the only one—the only one what lived, anyhow. The rest died of a burning fever soon after they was born. That’s why the longships stopped coming. No point trying to populate a planet that downright refuses to be populated. So there’s just the old timers, less of them every year. There’s the graves behind the church—my sister’s too. Janely would’ve been eight if she’d lived. And then there’s me, the freak. No one can understand it. They studied me when I was a baby and found nothing different, no sneaky stuff that had slipped into my cells when Maw weren’t looking. No matter what that fool Jacob says. Making out like he knows something the scientists didn’t. The scientists left long ago, so there’s no one for me to ask my questions, not that I rightly know what to ask. No, there’s just folk like Maw, trying to scratch a living from acres of snow and ice and woods what hide things you wish you didn’t know about. I wonder how long Paw suffered before he died. Jacob and Hilsa tried to take the skid into town. Maw lit into them and then she took out the reactor, what makes the skid work, and now we’re all stuck here, thirteen kilometres from town. It’s like Janely all over again. Maw went crazy then too. I thought Maw would hit him but she didn’t. She just went all quiet and still and then she went into her room and banged the door shut. I wish Jacob hadn’t said anything, but he blames her for letting Paw wander off on his own. As if Paw ever did anything Maw wanted. Stores are running low. Even the nutri-pills are gone. No help for it but to go out and hunt. Hilsa refused to help—she’s such a scaredy cat—so that left Jacob and me. We pulled on our jumpsuits and sweaters and gizla-skin cloaks, and then we strapped on our snowshoes. Jacob took the traps and Paw’s exploding tip gun, the one we found half-buried in the snow just outside the forest. I took the sled and the knives, and then we opened the shed door and walked out into the cold. Wind and ice and purple shadows whispering like they was waiting for us. I shivered and clumped my way across the snowfield. Winter twilight’s the best for hunting. And being hunted. That’s why you need two people—one to hunt and one to watch your back. But Paw went alone that day, with not even the dogs for company. A Dream called, and he listened. Or maybe he were just tired of it all. Maybe he got over-confident. I sure don’t know. Jacob snorted and kept walking. I scowled at his back. It was just that one time two years ago when I turned twelve, and they never let me hear the end of it. Paw took Jacob and me into the forest to hunt gizla, and I saw something—no, I heard something—and I took off after it. I couldn’t help myself. It was like a song, but not with words and music and dancing. Not like first summer’s eve at the town hall. I could never explain to anyone afterward what I felt. Like I followed the song but I was also in the song, and then Paw was dragging me home by the ear, red-faced and hollering. Maw thought maybe a Dream swallowed me and I wasn’t tasty enough, so it spat me out again. Maybe she’s right. And maybe that’s why Jacob looks at me funny sometimes. We neared the forest. I could tell Jacob was nervous. So many firsts. First hunt of the season. First time without Paw. I smelled them before I saw them, elongated shadows loping toward us from the forest. I screamed, and Jacob whipped the gun off his shoulder. He took aim and let fly and six bodies dropped to the ground, dark stains spreading on the snow. The rest melted away, back into the ice trees. A stench rose from the ground, and I tried not to gag. “All that meat,” I said. “Such a waste.” Naargs tasted like death. Jacob lowered the gun. I could see he was trying not to shake. “Okay,” I said, and we walked on. The ice trees closed over us. Black ice twisted into trunks and boughs and tendrils and arches that not even the summer sun could melt. Here the chitkil sang, just before the sun slipped away from the rim of the world. Four moons of summer followed by eighteen moons of winter. How fair is that? We reached a small hollow with a bubbling hot spring what made crazy shapes around the edges of a pool. We took off our snowshoes and I unloaded the traps. My mouth watered thinking about gizla steak. Then I sniffed the air. Jacob squatted on his haunches and raised the gun. That’s when the song started. I found myself standing, turning around, walking away. I could hear Jacob hollering behind me, could hear the gunshots and the snarls, but it was like a vid in another room. It wasn’t real, wasn’t important. The only thing that was important was the song, and getting as close to it as possible. And if it were a Dream what called, what then? I didn’t care. If this was how Paw died, then it was a fine thing. The notes high and sweet, the longing so sharp I couldn’t bear it. I began to run, my boots sinking into piles of fresh snow. Somewhere I lost my hooded cloak. The cold rushed into my ears. Icicles stabbed my face. But I didn’t stop—I couldn’t. Not until I skidded on the edge of a frozen pond and saw who was waiting on the other side. The song died and something squeezed my heart. The sudden silence was painful—or perhaps it was seeing Paw again that made me feel like blubbering. I stepped on the black ice, digging in my crampons. The ice would hold—it always did. But in the middle of the pond, cracks opened under my feet. I had no time to think, to react. I fell, arms and legs flailing. Black water gushed into my screaming mouth. I woke to the orange glow of fire. I stretched my hands to it and sighed. I was all warm and comfy, like I was in Maw’s bed, snuggled up to her side. Wait, that was years ago. Where was I? I blinked and looked around. The Black Ice Forest. Paw sitting on the other side of the fire, turning meat on a stick. I tore into the meat, burning my tongue. With a pang I thought of Jacob. I was supposed to be watching his back. How had he read my mind? Maybe I’d spoken aloud. “The naargs?” I said. I laughed too because it was funny and I was that dumb. Paw must have saved me when the ice broke under my feet. Though it was weird, the ice breaking like that in dead winter. And I couldn’t figure out why he’d left us to come live in the forest. And then I looked again and it weren’t Paw at all, just something that were wearing Paw, like a skin. “Who are you?” I said, although I didn’t feel scared. Not yet. “Who are you?” it said, and tossed me another bit of meat. I wolfed it down before talking, I was that hungry. Inside me. I tried not to vomit but they came out anyway, all evil-smelling, those bits of meat I’d just eaten. So this was why I had survived. Jacob was right. I was as alien as the thing sitting opposite me. My throat burned. I wiped my mouth and looked up to find it watching me. “Adult humans could withstand us, but the new-spawned could not, unfortunately,” it said. “You killed and ate Paw, didn’t you?” I said. “Why only me? Why not the others?” Why am I alone, I wanted to scream. I got up and walked away from the fire. I guess I couldn’t bear looking at it no more. Couldn’t bear thinking what it had done to me. It didn’t try to follow me or anything, but a little later I stumbled into a clearing and there it was again, my fake Paw, warming its hands in front of another fire. I swallowed hard. “Janely,” I said. “Wish you was really here.” Tears leaked out of my eyes, froze on my cheeks. I knew it was just a trick, that I was being a fool. But seeing Janely all growed up, the way she should’ve been, just tore something inside me. And the hardest part was knowing that it didn’t have to be this way. I thought of the mayor slobbering over me and would’ve puked again if there was anything left in me to puke. “I’ll think of another way,” I said. Paw disintegrated, pieces of flesh and blood flying apart. The fire died away and the cold crept into me, along with the realization of what I’d just done. Would I have done it if the Dream weren’t in me already? I thought of Janely, and I knew the answer. I don’t remember how I made it home. They helped me in some way. I knew they was there by the notes of the song that drifted to me now and then. The song kept me going, kept the worst of the cold away. Through the forest and across the snowfield and by the time I reached home, I even had my gizla-skin cloak on. I hammered on the door and Jacob flung it open. I stumbled in and fell on the floor. Then it was like I was outside looking in while Jacob and Maw dragged me to the fire and Hilsa stripped me down to my jumpsuit. For the longest while I couldn’t speak or think. When I’d pulled on some dry sweaters and gulped down a bowl of broth Maw shoved at me, I started to think I might live after all. I looked at my family, at their worried faces, and it hit me then. I wasn’t alien like them Dreams. But I wasn’t like Jacob nor Hilsa neither. I was something in-between. And maybe that was okay. Maybe that was best. “It got a lot more’n that,” I mumbled. 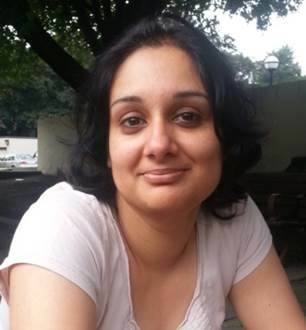 Rati Mehrotra is a science fiction and fantasy writer who currently makes her home in Toronto, Canada. When not working on her magnum opus—a series of fantasy novels based in a fictional version of Asia—she writes short fiction. Her short stories have been published at AE—The Canadian Science Fiction Review, Abyss & Apex, Inscription Magazine, and LampLight. Find out more about her atwww.ratiwrites.com. Can’t get over the beginning and the end of the story…and a very gripping in-between. Havn’t read a piece like this in a long long time…Mind blowing!